Warm up your fingers, because another Tap Battle has arrived in Fire Emblem Heroes! Prepare a team of your favourite units to tackle Illusory Dungeon: Shadowed Memories. You can find it in the new Events menu at the bottom right of the Battle screen. Like other Tap Battle events, this event is more of a rhythm game than a strategy RPG. Tap the screen in time with the music to defeat waves of enemies. Swap between Casual and Expert mode and/or Normal and Hard difficulties to find the playstyle that’s best for you. You can also alter the music, effects, and other settings. The first eight stages are available now, and four new floors will be added every day. You can also earn Hero Feathers and Great Badges with daily quests! Make sure to play every day to reach the end of the dungeon and earn all of your daily rewards. Who knows what could be waiting for you at the end? Tap Battle: Illusory Dungeon: Shadowed Memories will be available for two weeks, fading into the mists on 6 April at 6:59am UTC. Additionally, Mini Acrylic Figure Collection Vol.3 will be coming soon! 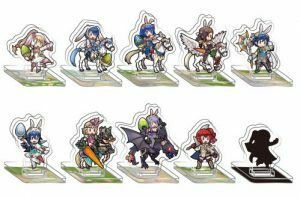 This latest mini-figure set contains chibi versions of all eight Spring Heroes, Anna, and a mystery figure. If you’re interested, you can pre-order a box on AmiAmi for a late April release. I wonder who that mystery figure could be? Why would they need to cover her up? 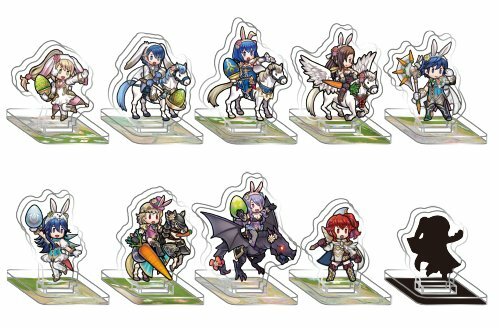 Then again, the “secret” figurines in the previous sets were Feh (okay) and Reinhardt (why), so they don’t really need a reason. 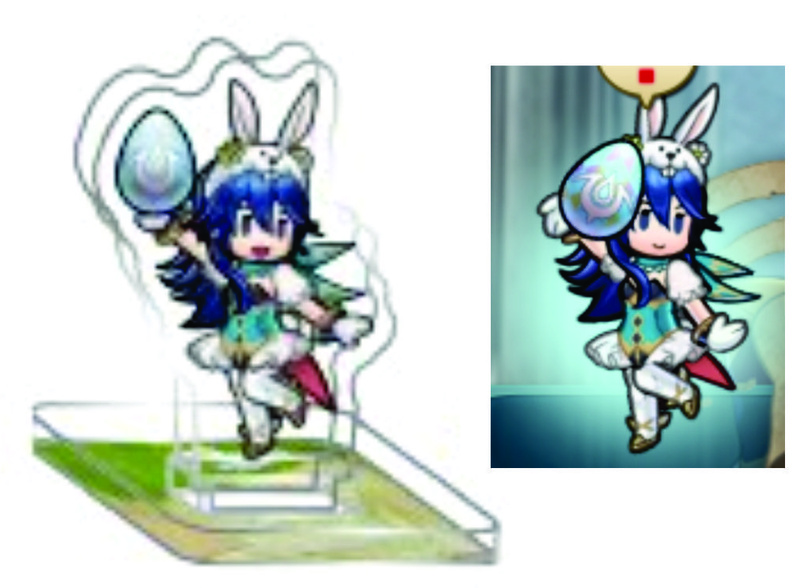 Also vanilla Sharena still doesn’t get a figurine, being passed over in favour of her bunny version. Sad. At least Anna is here! 99% sure it’s Delthea. The piece that can be thought as pants is the “tail” of her robe, and this looks exactly like her ponytail. Give me a minute (not literally) and I’ll whip up her sprite from the assets. Her pony tail is too thick on the tail end to be her’s, plus the ‘tail’ of her robes flow back during her attack so it doesn’t line up with looking like pants. Also her legs come in close during her attack animation, the silhouette’s is spacing out more with one leg doing a little pop. I could have done better if I had any artistic talent and weren’t as bad at perspective. It is very definitively Delthea. 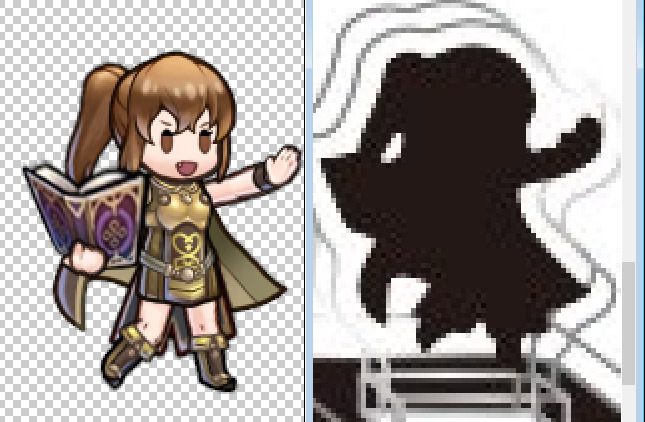 There are plenty of small discrepancy between the two: hair shape, tome position, angle of her arm, however the counter to it being Delthea is that her legs and feet don’t even come close to matching up as at no point during her animations does her right leg do a pop up like you see in the silhouette. I’d love for her to get one of these, but this aint it. We’ll just have to wait and see. Unless it actually turns out to not be Delthea, I will maintain that it’s her. I believe is Delthea too. For me, the arm and legs format don’t match with Robin’s, so I don’t believe the shadow unit is our “Mystery Tactician: F! Robin”. The first time I saw it, I thought it could be Tharja, but the sprite shape don’t match. But where is the bow in her hair? Believe it or not, I simply forgot to put the bow in her hair when I was assembling the sprite. The bow would cover a part of the gap, leaving some uncovered. I wish I actually had a Delthea in my barracks because I always forget to screenshot as I’m fighting her. I only see the tail on the left side but not the right side, which during Robin’s attack animations we see both very clearly; also it should be noted that where Robin’s pig tails start are lower than what we see in the silhouette. Another thing to note is actually the legs, specifically the pant bottom, it doesn’t match up with any of Robin’s canonical designs and the silhouette seem to be wearing a cap, not a robe. So unless they give F!Robin a completely unconventional design that breaks from the current FEH mold, it’s not her despite the supposed datamine leaks. It’s not Delthea either as it also doesn’t matchup. Keep in mind too that we haven’t had the Thracia banner yet which, by the time this set is available, will have come out already with it’s accompanying TT and/or GHB, so my money is actually on it being Ishtar as the hair does match up and her we don’t know how updated/different her design will be from the original works. Can’t wait for more hot springs!